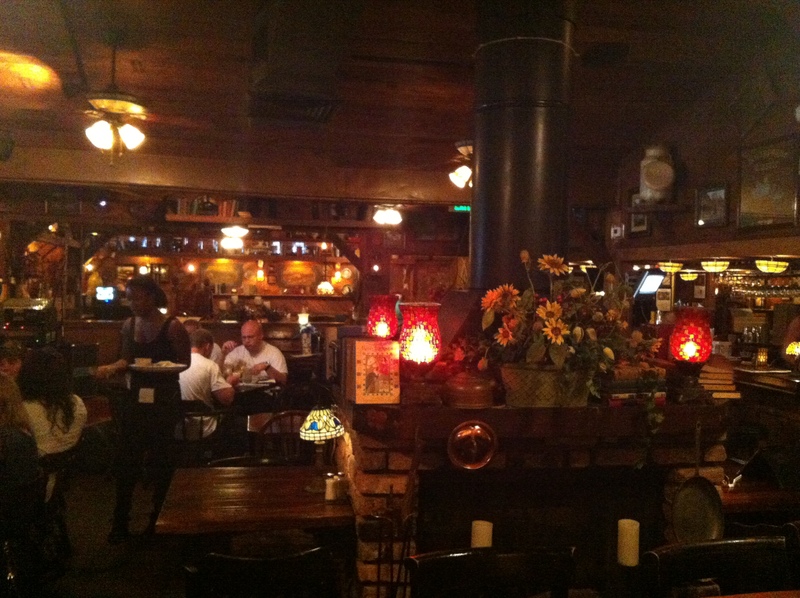 Kathryn says: The Field Irish Pub & Eatery is a charming restaurant on Griffin Road that takes you away. I’ve never been to Ireland, but I felt like I was visiting when I entered the doors of The Field. It definitely gives off that European feel. I was introduced to the restaurant when a colleague invited me to join a group for lunch there, and I had no idea what a find it would be! 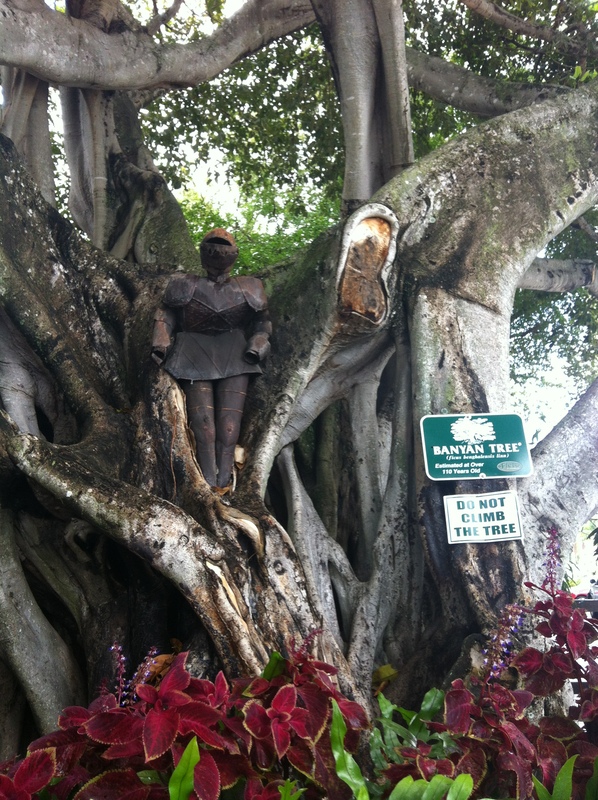 Upon first arrival, a knight in shining armor greets you from a 110-year-old banyan tree. The tree towers over a substantial outdoor seating area with large tables shaded by green tarps. I loved the finishing touch of the white string lights along the perimeter. 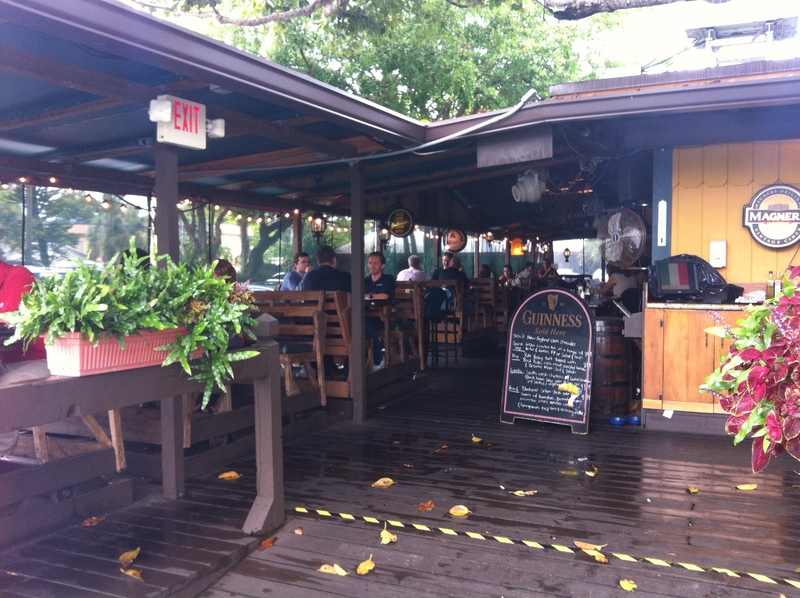 There’s a cute little outdoor bar around the corner with high-top tables near the entrance. Once you walk inside, the lights are dim, but there sure is a lot to look at. Around almost every corner, there’s a fake fire place and some knick-knacks that it looks like they took from my Grandmother’s house, as she pointed out when I brought her on my second visit. There’s old china plates, books, fake flowers, pots and pans and antique lamps in every nook and cranny. It’s a very spacious place with tons of seating, some on tables with barrel bases. 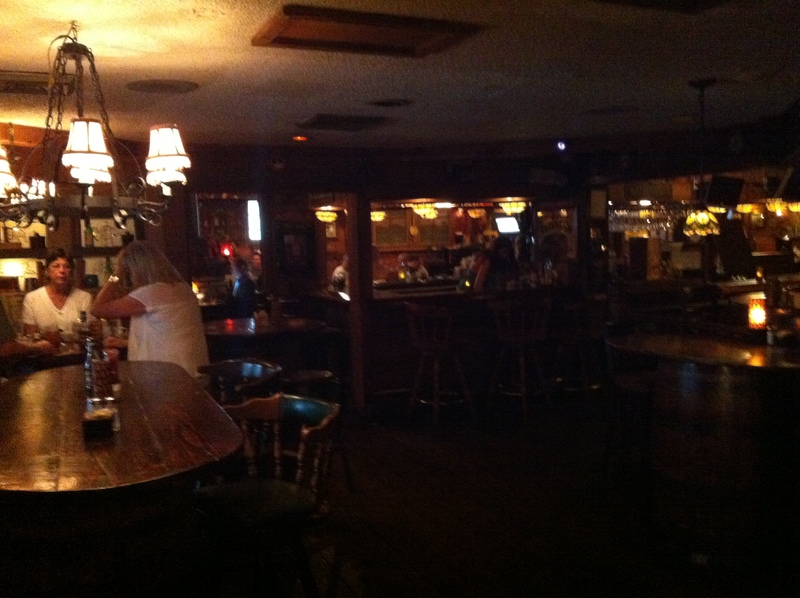 The place is full of dark wood furniture and low-lit lamps. It’s very cozy and seems like the perfect place to camp out for a long meal on a rainy day or to relax for a celebratory evening with a group of friends. As any good Irish restaurant would have, their menu is loaded with potatoes. On my first visit, I ordered an iced tea and one of the lunch specials – a fried fish sandwich with french fries and Irish potato soup. The unsweetened tea came in a mason jar, which I found to be adorable. The fish sandwich was gigantic, perhaps a foot long. 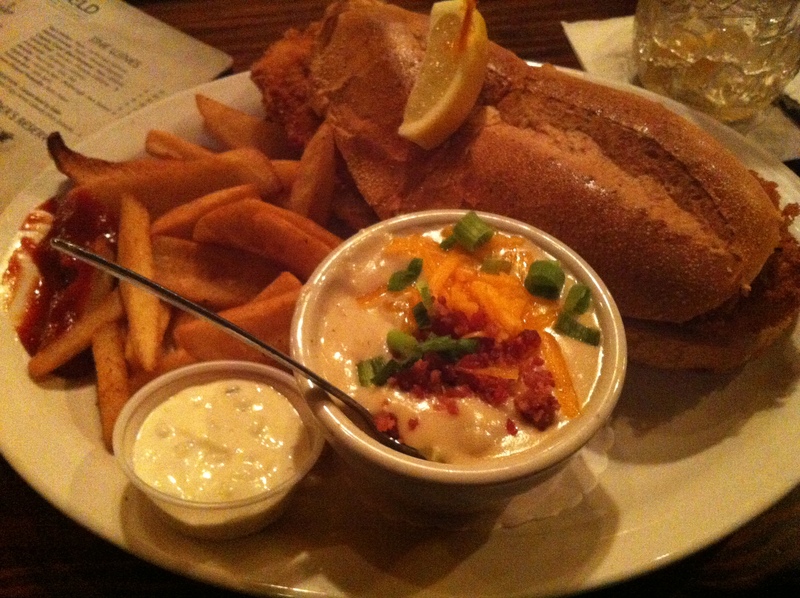 It was crunchy, crispy white fish served on a long loaf of white bread with lemon and tartar sauce on the side. I’m picky when it comes to fries, but someone at the table said they were good here, so I went with it. They were delicious, thick steak-fries with light seasoning. I enjoyed them dipped in ketchup and dunked in my potato soup. The potato soup was creamy and had medium-sized chunks of potato in it. The bacon bits, scallions and cheddar cheese on top filled it with savory flavor. On my second visit to The Field, I brought my Grandma for dinner. We were in the mood for drinks, so we each got a Black and Tan, which is a tasty mix of Guinness and hard cider. For my meal, I ordered the Country Chicken Pie, a homemade casserole with chunks of chicken, chopped mushrooms and onions, sliced carrots and peas. 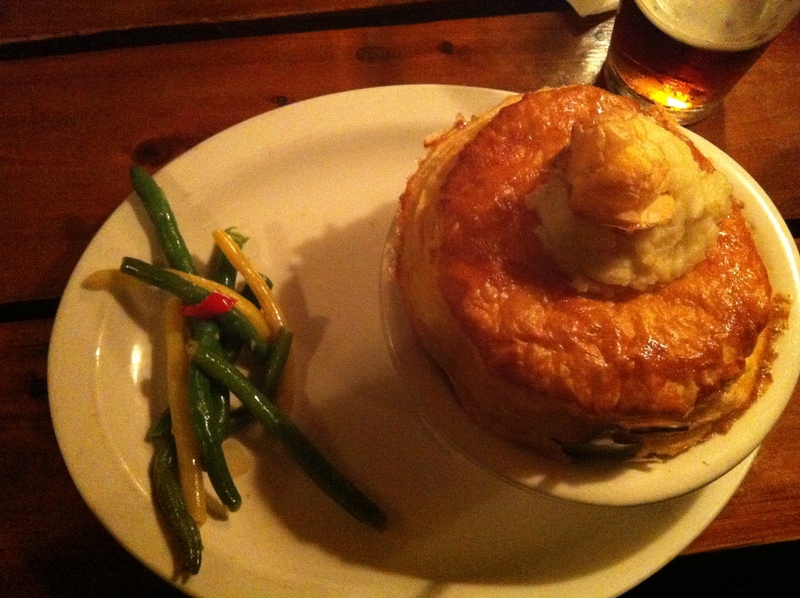 A giant, flaky pastry sat on top with a scoop of mashed potatoes. It looked like a decadent dessert pastry with a scoop of ice-cream and a cream puff on top, don’t you think? Or maybe I just had a sweet tooth. The pastry was surprisingly light and airy. Underneath, the tender chicken and fresh veggies were mixed into a flour-like gravy that gave it the consistency of a soup. The small side of green (and yellow) beans was good and buttery. 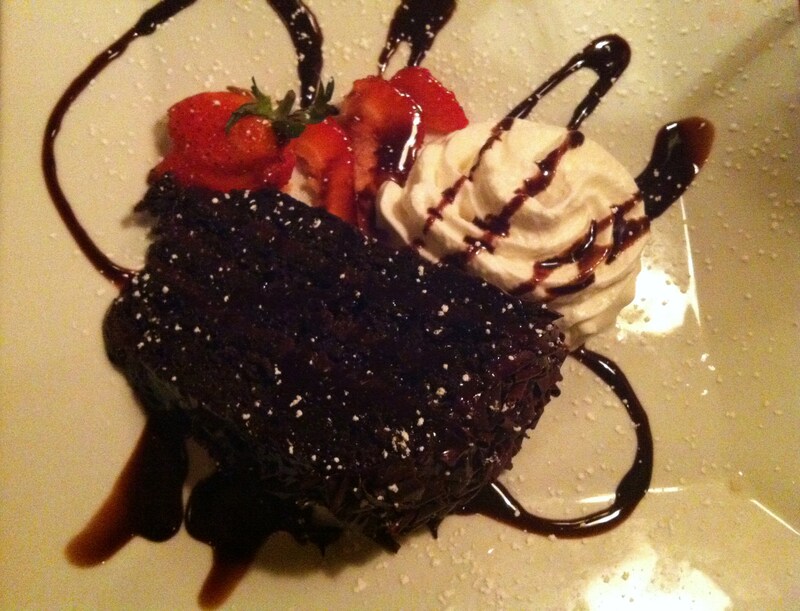 For dessert, we split the Decadent Chocolate Cake. It came with a few sliced strawberries and some whipped cream on the plate and chocolate syrup drizzled on top. As you could imagine, the cake was rich and loaded with a gooey chocolate icing. Perhaps I’ll come back to catch some live Irish music some time.